We’re excited to be carrying a new kind of tea! Yaupon! Yaupon Tea (Yow-Pon) (Ilex Vomitoria) is a type of holly plant native to southeastern North America. 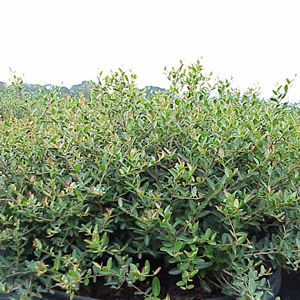 It is a small tree or shrubbery with glossy dark green leaves. The fruit growing off the branches are small and red. The fruit are an important form of nutrition to many bird species such as duck, quail, turkey, bluebirds and others. Black bear, fox, raccoon, skunks, and deer also eat the fruit! The leaves and stems are brewed to make the tea. The yaupon plant was prized among Native American tribes in southern Florida. The tea was used for male-only purification and unity rituals. The tea has ingredients such as caffeine and theobromine, making it different from other caffeine free herbal teas. It gives the drinker a boost without the jittery after affect! It also offers health benefits such as high anti-oxidant levels, anti-inflammatory properties, and aids in prevention of osteoporosis! Try it in its traditional holly, roasted, or blended with various other herbal teas. It’s delicious hot or iced. We even made an iced tea lemonade out of our coconut-lavender blend! Come in and try a cup, or buy some by the ounce to enjoy at home.